Get Ready for February 2! RALLYING POINT FOR SATURDAY, FEB 2nd: We will be assembling at the intersection of Mountain & Main in downtown Stone Mountain at 9AM. To avoid being towed, find parking on a nearby residential street and walk to the assembly point. Allow at least 20 minutes for finding parking and walking in. We encourage carpooling and ride shares. The 119 bus from the Indian Creek MARTA station is also an option, but since the Super Bowl might produce bus delays, allow extra time. Follow our social media for further updates. See you on Saturday! Are the KKK and neo-Nazis going to show up? Even though their permit to rally was denied, the “Rock Stone Mountain” white supremacists have said they are determined to enter the park on Feb. 2nd. They are now stating that they may mobilize in several smaller groups on the day. Since they are loudly saying that they will show up, we are prepared for them to show up. Is "Rock Stone Mountain" just calling to preserve Confederate monuments? Is it a "Heritage Not Hate" rally? No. “Rock Stone Mountain” is an explicitly white nationalist event, organized by neo-Nazis and members of the KKK. They are calling to preserve racist monuments, but they also want to undo the achievements of the civil rights movement and to establish a whites-only society. Will the park be open or closed? We don’t have control over this. There are no current plans that we know of to close the park, but park officials might decide to close for security reasons. This would mean the gates would be closed to cars, but there are also pedestrian entrances to the park. How safe is the anti-racist counter-mobilization? The Klan and neo-Nazis are inherently violent. Police often try to repress anti-racist protests, sometimes brutally. We will do our best to facilitate people participating in ways that involve less risk. However, there are some physical, legal, and psychological risks that are unavoidable in a mobilization such as this, especially for people who have already been traumatized by racism. Please be aware of these risks when making plans for Feb 2nd. We recommend making arrangements for childcare. Will the white supremacists have guns? It’s possible. Posts on the “Rock Stone Mountain” social media suggest that some attendees may be armed. As protest organizers, we are not making a recommendation on this issue. Stone Mountain Park allows visitors to bring firearms. It is your responsibility to familiarize yourself with the legal situation and the gun laws of Georgia. Will the Klan be hooded? Based on what we’ve seen at previous actions, the KKK will probably not be hooded or in robes. Can we wear masks to protect ourselves from being identified and targeted by the KKK? We understand that anti-racists may wish to wear masks to prevent from “doxing” and harassment by neo-Nazis. Georgia state law 16-11-38 makes it a misdemeanor to wear a mask that conceals your identity. This law was originally created to prosecute the KKK. Case law in Georgia has established that masks are only illegal when worn for the purpose of intimidation. However, in recent years, police have used the state’s mask law as a pretext to arrest anti-racist protesters, even when the police cannot establish an intent to intimidate. Activists are currently challenging this application of the mask law in court (see our press releases). If you’re concerned about being targeted but not sure if you want to wear a mask, sunglasses and a hat can be an effective half-measure. Wearing clothes that cover identifying tattoos is also a good idea. We encourage you to educate yourself about the law and make the best decision for your safety. We are not making a recommendation about this. Be aware that any video footage can be useful for documenting repression by the police or violence by neo-Nazis, but it can also endanger anti-racists. We encourage you to be mindful and ask permission before filming fellow protestors. I've never been to a protest like this before. Do you have any tips? 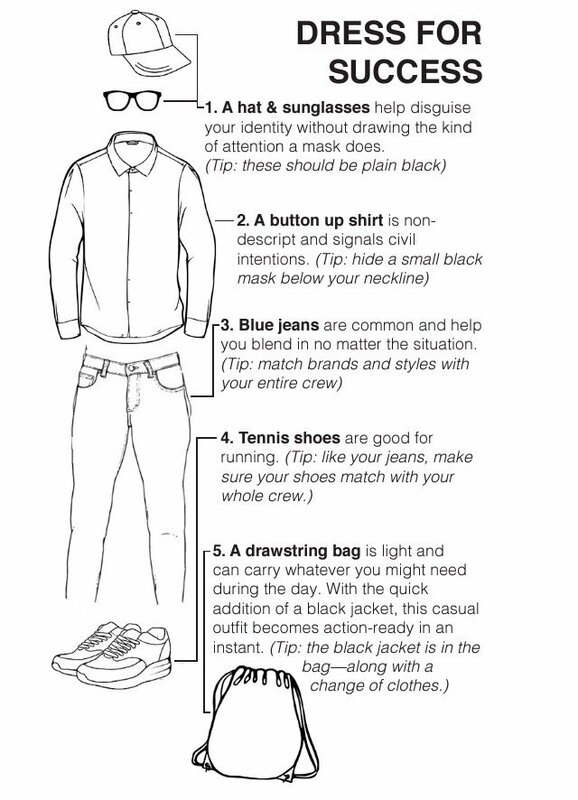 Wear comfortable, weather-appropriate clothes and shoes. Be prepared for cold and rain! Show up well-rested and on time. Bring a friend, or better yet, come with a group. If you’re with a group, choose “buddy pairs” and stay with your buddy throughout the day – if you get stuck in a crowd, it’s easier to keep track of one person than a group. Also, make sure that a trustworthy friend who is not coming to the protest knows where you are. Bring plenty of water and a snack. Some small first-aid items like bandaids are also helpful. If you want, bring a sign with your anti-racist message. Email us at [email protected] if you’d like to fill out a jail support form. This form will include all the information our jail support team will need to support you if you’re arrested, including any specific needs you have or any logistical concerns that might come up. We will announce the jail support phone number at the beginning of the protest. Write this number on your body with a permanent marker, somewhere like the inside of your arm where it’s not noticeable. If you are arrested, call this number to let jail support know where you are. If you rely on daily medication, bring a day’s worth with you, as well as some proof of your prescription. This will ensure you’ll have your meds for the (probably short) amount of time you will be in jail, and you’ll be protected from an extra nuisance charge. If you bring a phone, lock it with a password before the action. You have the right to privacy and are not required to grant police access to your phone, even if you are arrested. Tell your trusted friends to follow our social media and donate to the bail fund! The Atlanta Solidarity Fund is collecting bail donations for any anti-racist activists who are arrested.